Our latest gallery exhibition, Super Vision, opened last night with a spectacular preview. The balmy evening saw an influx of collage fans flocking to the gallery to see brand new work by two of the best artists working in the medium today. 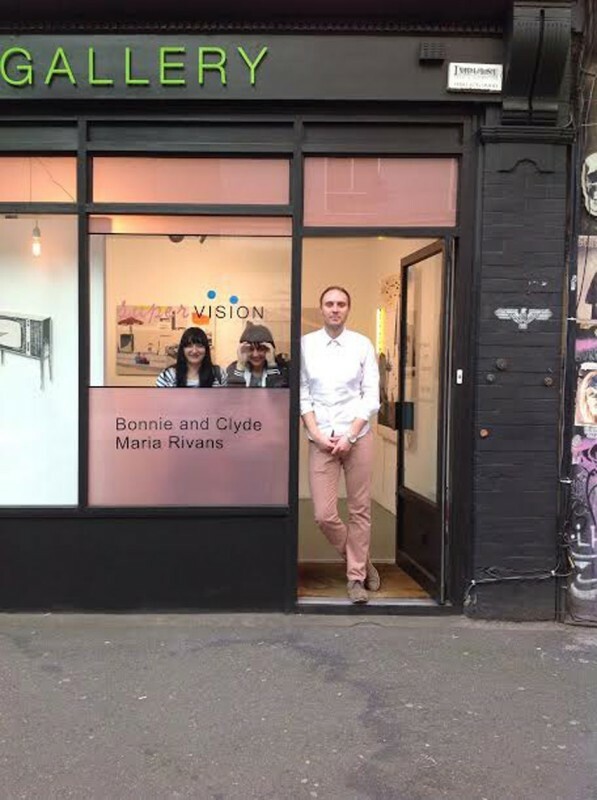 Super Vision is a joint exhibition of work by contemporary artists Bonnie and Clyde and Maria Rivans, both of whom are known for their mastery of collage, colour and composition. The collaborative exhibition is a celebration of alternate realities, fantastical other-worlds and voyeuristic adventures... Read more about the show here. Just as the quote on the wall foresaw, “Happiness consists in realizing it is all a great strange dream.” (Jack Kerouac), the delightful evening offered fans a thoroughly exciting trip into extraordinary visions by two extraordinary artists. The exhibition has been divided over the gallery’s two floors, with Bonnie and Clyde’s work upstairs, Maria Rivan’s below, and the staircase offering a superb combination of the two. Bonnie and Clyde’s themes include the iconic sand, palm trees and colourful architecture of Santa Monica and Venice Beach, LA, New street scenes, idols from the ‘New York no-wave’ scene of the 70’s and 80’s, and, for the first time, London! Whilst Maria Rivan’s new work appropriates an array of sourced vintage ephemera to construct surreal and breathtaking visions of old Hollywood stars and Hitchcock-inspired scenes.